As with any wildlife-viewing experience, the more informed you are, the more you’ll appreciate what you’ll see. Start by picking up a copy of “Crane Music” by Paul Johnsgard. A breezy and nontechnical read, this book is an excellent introduction to the sandhill cranes and their migration. With a little knowledge about the birds, you’re better prepared to make the trip to the Platte River valley. You’ll likely have learned that the latter half of March is generally the most reliable time for viewing. Late March weekends are especially busy for those leading guided tours (Rowe Sanctuary and the Nebraska Nature & Visitor Center), so if you’re interested in taking a tour then, make reservations well in advance. Utilizing blinds located along the Platte River, guided tours generally offer the best possible views of the cranes. Tours are given in the early morning and late afternoon/early evening, as the birds depart from and arrive at their nighttime roosts, often in huge, very noisy throngs. Tours are not for the impatient or very young. If you want to see the cranes at sunset and your birding contingent includes small children, find a public viewing platform along the Platte. One platform is located one-and-a-half miles south of the Alda Road exit (number 305) off Interstate 80. Public viewing platforms are often crowded near sunset, particularly on peak weekends; arrive there well beforehand. The easiest way to see cranes is driving a few of the back roads along the Platte. Numerous cornfields and a few remaining wet meadows give the cranes many feeding spots during the day. The Platte River Road between Doniphan (about 11 miles south of Grand Island) and the Alda Road are paved and feature two parking areas for crane viewers. Many other roads near the river are unpaved, and rain or snowmelt can turn them into muddy messes. Stop by the Nebraska Nature & Visitor Center or Rowe Sanctuary before trying these; we may be able to steer you away from potential quagmires and an expensive visit from a tow truck. A few basic items will greatly enhance your viewing experience. Binoculars or a spotting scope present more details of birds than your eye alone. The “Nebraska Gazetteer” gives details of back roads in the area (and throughout the state), should you want to go off the beaten track. If you’re spending any time outside, cold weather gear is a must: coats, gloves, boots, hand warmers, etc. Look at the air temperature and dress for 20 degrees colder; you’re more likely to say warmer longer. Lastly, these cranes are wild birds; they’re looking for food, hoping to survive bad weather and avoid predators—in short, just trying to stay alive while preparing for a long journey ahead of them. They’re not putting on a Disney-type production for our entertainment. Try not to disturb the cranes; doing so only makes their lives more difficult. 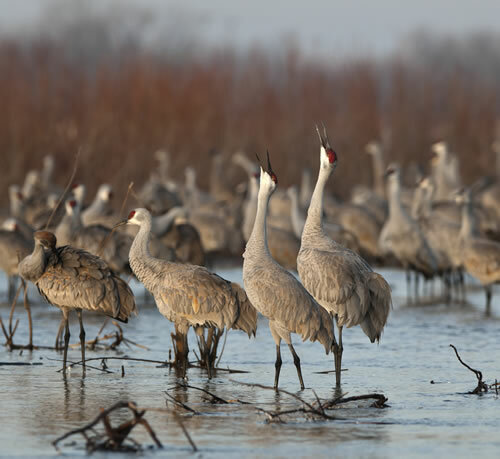 With a little preparation, the sandhill crane migration is an unforgettable experience. 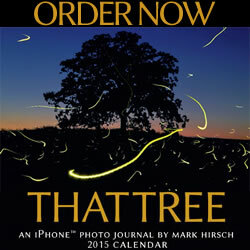 You’ve heard about it but haven’t seen it up close? Don’t wait any longer—make this the spring you take the short trip to a truly world-class wildlife spectacle.